Heavy favorite Demi Leigh Nel-Peters was crowned Miss South Africa 2017 at a star studded crowning event at the Sun City Superbowl on March 26, 2017. This 21-year-old African goddess is a Business Management and Entrepreneurship graduate from Sedgefield in the Western Cape. She will now represent South Africa at the 2017 Miss Universe and Miss World pageants. At the same event, medical doctor at 2 Military Hospital in Cape Town Adè van Heerden was placed as the 1st Princess) while Boipelo Mabe was the 2nd princess. 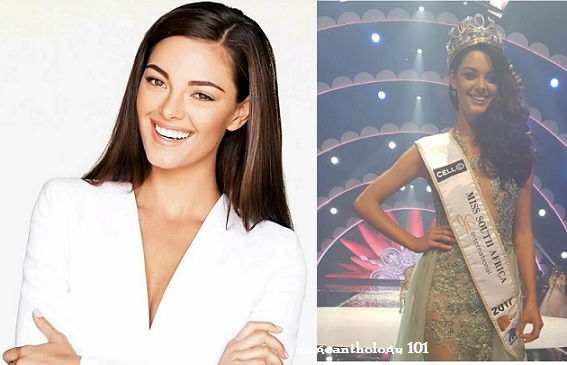 South Africa has won 3 Miss World : Rolene Strauss, Anneline Kriel and Penelope Coelen have won the Miss World titles in 2014, 1974 and 1958 respectively. In 1978, Margaret Gardiner became the first South African and African woman to win the Miss Universe title.